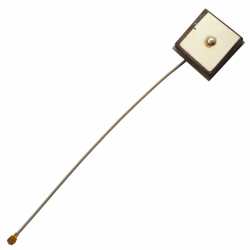 The Echo 26A is an active, embedded GPS antenna, measuring at 19.7 x 19.7 x 6.6mm. This high gain ceramic patch antenna is perfect for GPS applications designed to include embedded solutions that can still produce high levels of performance despite its small form factor. With its built in Low Noise Amplifier (LNA), this active GPS antenna produces an impressive peak gain of 27dB that drives strong satellite signal reception and transmission strength as well as influencing a quick time to fix to satellites. These two factors are vital for your GPS system to maintain live positional information, especially when the signal from the satellite is weak. Common applications include: vehicle/fleet/asset tracking, mobile applications and general position services. The Echo 26A has a centre frequency of 1575.42MHz for GPS compatibility. The built in Low Noise Amplifier (LNA) produces a gain of 27dB, working on a current range between 7-16mA @ 2.5-5V DC.